If we expect to have a livable future in Pittsburgh, we’ve got to believe that we deserve better. In this case, it means keeping Amazon out. Our resources are our land, our taxes, our infrastructure and roads, our beautiful housing stock, our working-class mythology and culture. Not only are the corporations coming here to take that from us, our elected officials are giving it to them. And then we’ll not be able to live here anymore. 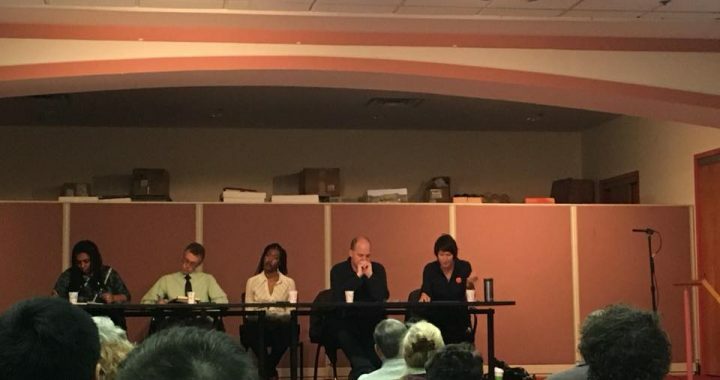 There was an excellent panel this weekend hosted by the Community Power Movement and the Human Rights City Alliance to talk about the impacts of large corporations on public institutions, resources, and democratic processes. The panel was moderated by Michelle King, and the panelists were Kelauni Cook from Black Tech Nation, Rich Lord from the Post-Gazette, Chris Potter from City Paper, and PPT’s very own Laura Wiens! Check out the video shared by Public Source shared by Public Source to see the excellent discussion. …The problem is not Uber or Amazon, per se. Capitalism will do capitalism, and it’s the nature of these companies to disguise their harms in order to maximize profits. I lay the blame squarely at the feet of our elected officials and our public agencies who that are doing this work for them. Our City in January hosted a “Mobility Showcase” that was basically a several hour-long advertisement for AVs and other tech. Can’t those companies rent the convention center themselves?